Paris (May 14, 2018) – Ymagis Group, the European specialist in digital technologies for the cinema industry, today reported its consolidated revenue for the first quarter of 2018, ending 31 March 2018. Apart from VPF, a strong quarter for technological services-related activities Revenue for Ymagis Group fell by 5.4% to €39.3M during the first three months of 2018 due to the anticipated acceleration in the decline of VPF activities. This is partly offset by the growth in service activities (+4.1% at €25.6M). VPF revenue fell by €3.2M during the first quarter of 2018 €13.7M. In line with expectations, the decline in VPF activities is picking up speed under the effect of the initial recoupments made at the end of 2016 and those made in late 2017 in Germany and Bulgaria. 5,407 screens were under VPF contracts on 31st March 2018 as compared to 5,918 one year prior. 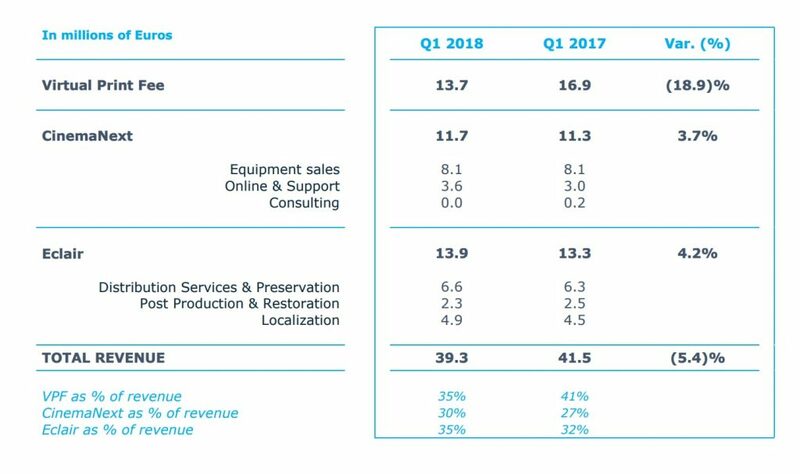 Buoyed by its services activities,CinemaNext recorded growth during the first quarter of 2018, in particular within the Online and Support division, with revenue up by 3.7% at €11.7M. In a context where sales linked to the replacement market have yet to take off, new cinema installation projects have kept equipment sales stable. Initially anticipated for 2018, Eclair’s return to profitability is expected to be delayed by an additional year as a result of the significant investment in R&D the Group agreed to incur to develop and market these new platforms, which are instrumental to a solid, sustainable and profitable growth. Finally, the Group reiterates the targets of its Perform Plan for 2020 as announced in the full-year 2017 results.